How to surrender a Junk Insurance policy in India? Do you hold any Endowment or Money back plans sold to you by any of your relative, Neighbor or were it bought by your Father for you for your “Secure future”. Most of the people hold Junk Insurance Policies which are of no much use to them . Policies like Endowment or Money Back Policies hardly bear Inflation and have no ability to meet your long term goals like Child Education, Child Marriage or Retirement. Note: All the points I have mentioned are generic and might be little different for different policies, but overall it would be similar. Also, points I am going to discuss are for people who are not happy with their policies and want to get rid of them. People who are very happy with their policies are advised to continue the policy. I will discuss different scenarios and you can see which category you belong to. Before that lets understand some basic things which you might not know. what is meant by making a policy Paid up? It means that you will stop your further premium payments, but your Insurance cover will come down by the same ratio. So if you policy tenure was 20 yrs and cover was 10 lacs , and you have paid your premiums for 4 yrs and then make it paid up , then your cover comes down to 2 lacs , because you have paid for just 20% of tenure. When you make the policy paid up then you receive all your premiums paid and Bonus accrued till that time (only if your policy has run for more than 5 yrs) at maturity. Surrender Value is the amount which a policy will pay to policy holder if it’s terminated before the maturity period. Most of the Endowment and Money back plans don’t have any surrender value. Even after 3 yrs, the policy surrender value is very less, Generally it’s the “Net present value” of the amount you are supposed to receive at maturity. In this case you don’t have much option, It’s great if you have paid for 1 yrs or less , You can/should just forget the money you have paid and start deploying your hard earned money in something better . In case you ULIP;s you can continue paying because after 3 yrs the money you can get is equivalent to what is actual worth that time and you have much better control over how your money is invested . But anyways you have done a big mistake . See the list of top mutual funds you can invest in for long term . I have paid premiums for more than 3 yrs but Policy has more than half the tenure to run . The best thing you can do is to make your policy paid up or take the surrender value and from now onwards put your money in something which you really understand and which can give you better inflation adjusted and post-tax returns . I have paid premiums for more than 3 yrs but Policy is close to maturity now. Now it’s too late and you can let it run its whole tenure , You also have the option of making it paid up . In case you have paid the premiums for 2 yrs and thinking of surrendering your policy after that, then it makes no sense, because the amount you pay for 3rd year and what you get back after surrendering will be almost same. For example : If your yearly premium is 30k, and you have paid 60k in 2 yrs and now want to surrender the policy, but you are afraid that you will not get anything back if you close the policy before 3 yrs and thinking of making 3rd payment, then it makes no much sense. Because even after paying 3rd premium and then surrendering it, the surrender value will be close to 30-35k only. (surrender value after 3 yrs is around 30-35% of total premiums paid). Most of the people just continue their policies because they think “It’s very safe return and let’s not take risk”. You are taking very big risk by continuing, its called risk of “losing all the purchasing power”, agreed that it’s damn safe !! Throw out those emotions, save them for your spouse and parents. Get rid of those agents from whom you bought those policies just because he is your uncle or papa’s friend. Comments please – Are you one of them who are stuck in those kinds of policies and what is your next step, any other recommendation from your side? I am also having couple of LIC policies in which i got stucked. One of my policy completed 5 years and i got my first the money back. 1) If i will not pay the premium of my policy then it become paid-up, Right ? So once it become paid-up then at the time of maturity we will get the SA and Vested Bonus as well, IS IT ??? How LIC is going to calculate SA and Vested Bonus in case of paid-up policy ??? Will they increase the Vested Bonus every Year??? 2) Is it possible to change the term of the LIC policy ??? One of the LIC officer told me that it is possible to reduce the term of the policy, If it is possible the do i will get the Vested Bonus and SA as it is ??? 1. No , you will get premium paid + Bonus vested. Why will you get SA ? You can complain to Insurance ombudsman for this. I have been paying 28000 per year in Kotak money back policy ULIP, i’ll be completing 5 years by this month and i got 80000 bonus which is credited into my bank account. will i incur huge loss? can you please suggest me on this. I was missold two HDFC ClassicAssure Policy Plus of 7 years and 10 years premium paying terms. The HDFC agent had ‘assured” me that the policy would be converted into a One-Time Single premium payment, as I had mentioned that I cannot pay the premiums for such a long time. My total annual premium is Rs.100,000 and Rs 40000. I have paid the first year premium on both. As with others, the agent is not contactable now and the company is not willing to convert into a Single Premium. What is my recourse – should I continue to pay till 3/4 years to get the surrender value ; or should I stop paying any more premiums. I have Lic money back policy cover 500000 started in 2004 with a premium of 32000 per annum,paid 12 premiums so far. I got 100000each 2times as moneyback.Sir,if I want to surrender the policy this year how much I will get? Manish I have “Jeevan Anurag” LIC Policy with a premium of 20000(Half Yearly). it is started in April 2013 and I have paid 5 premiums. If I pay 6th premium of 20000 and surrender it than I will get only 24000 as surrender value. Of if I make it paid-up after 6th premium I will get 105000 after 20 years. I am getting confused. Should I make it paid up of surrender it. In Surrender case I will get only 4000 and in paid up case I will get 1L after 20 year. As my policy started on 25-april-2013 and I have paid 5 EMIs and my 6th EMI date is 15-Oct-2015, whereas 3 tears will complete on 25-April-2016. So my question is Shall I have to pay 7th EMI on 15-april-2015. Or just 6th EMI is enough to make it paid up. I have a traditional LIC policy with a premium of 24000 per year. This started in 2005 but after going through your articles I have stopped paying the premiums. Do I have to do something to make it a paid up insurance or it automatically becomes paid up on stopping the premiums. It will automatically become paid up once you stop paying ! I want to know if its advisable to continue with these LIC policies or Surrender/Paid up these policies. Your valuable suggestion will be really helpful. Thanks for the nice article, after reading this I understand the mistake I made by taking three LIC policies at beginning of my career. Now I am focussing on correcting my financial life, out of these 3 policies I got rid of one last year, surrendered one. This year I stopped paying premium for another one making it paid up. I have one questions for you, which came to my mind as I was reading somewhere there are some tax implications in surrendering policy. It would be great if you could throw some light onto it? The one I surrendered was LIC’s Jeevan Tarang.At end just wanted to share, I have become a regular member of jago investor club. I have been reading your articles, books. I must say I have become more aware as an investor. You are doing a fantastic job. I wish if I could join this club earlier -my financial life would have been in better shape now, anyway better late than never. I am lucky. I have read it before I buy any LIC policy. Welcome .. Glad to know that Girish ..
My neighbor who is Agent in max life insurance sold me 75years Endownment plan with 2 policy to pay 50000 per year for 3 year each. kindly request if i surrender my policy how much money i get it back and what important factor to look at. As its an endowment plan, you will get very less money at this moment as its just 3 yrs . Talk to your agent on surrendering of policy and also with Max Newyork life . hi i have LIC jeevan tarang policy sum assured 10 Lac, im paying yearly premium of 49920, tenure is 20 years , i have paid 2 premiums. After following your blogs , want to close the policy and switch to term insurance+mf. so should i wait to pay one more premium so that i can paid up or surrender the policy after 3 years? or i should close my policy as soon as possible and put money in other products? My father bought this policy for me…but i dont think i should continue this. Thanks for ur blogs…im reading your book 16 principles… its also very nice and eye opener. Plz help for lic jeevan tarang. I think first step it to take Term plan and health insurance , after that you can close this policy for sure ! Hi Manish. I have been sold Max Life Gain plus by Axis bank. I paid 50K but now that I have read about the drawbacks I want to surrender it. As I know I won’t get any money back from them but comparing the potential loss and gain from paying the rest of the amount, I think it’s OK if I don’t pay. Now the issue is that I put an FD of 1 lakh and ordered the bank to credit the amount to fund the policy. What is the option to me. Shall I say them before one year completes, will they deduct the amount. Please suggest. I didnt get your last point ? i have enrolled in jeevan surabhi 107/20 money back … i have 2 installment that i have paid (26,628 each). I have money back at 4th year 75000(25* of SA). I want to surrender this policy. Should i do it after receiving money back or should i do it now..? I have HDFCL Classic assure plan with premium of 30K /year, premium paying term 7 years. Policy terms 15 years. sum assured: 233726/-. started on 30.8.2011. Paid last on August 2011, 2012 & 2013. now this month is the another premium date. Due to financial crisis, not in a position to continue further. What to do Now? Shall i surrender or Paid Up, so that i can get maximum benefit. ( surrender value : first year Zero, 2nd & 3rd year 50% only). If i go with Paid up , what will be the affect on premium/ refund? Thanks for the article. It is quite useful. Till date I have paid INR 1.68 lacs for these endowment policies and the surrender value is INR 1.02 lacs. After deciding to surrender these policies, I happened to consult a senior LIC agent (other than the one who sold me these policies), who informed me that if I surrender these endowment policies after paying 10 annual premiums, I will atleast get back the total of all premiums paid till that time. Is it correct ? I have a doubt since , I could not find anything on the web related to this. Could you confirm please. If it is true, and if I make my policies paid up right now, and surrender them after 10 years from D.O.C , will I get back the total of all premiums paid till date ? You can pay for 10 yrs and then take back all what you paid , but then whats the use of it ? I have a Traditional childrens plan from HDFC life bought on Jan 2012. The SA is 15L, period is 20 years and yearly premium is 75000. I have already paid 3 premiums and I have claimed 80c deductions. I have made up my mind to surrender the policy in 2015. Could you please tell if there would be any tax on the surrender amount? I have gone through the entire article and all the answers to the questions asked. Still I have queries on my 2 policies taken for my daughters. a – Jivan Kishor/Jivan Chaya/Jivan Anand > 6yrs – So decided to surrender. b – Jivan Anand – 5 yr old – decided to pay 6th premium and then surrender. c – Jivan Tarang – paid 2 premiums of 28k – shall I pay 3rd and make it paid up or forget the money and start paying it in PPF. d – Jivan Tarang – paid 1 premium of 20k – shall I pay 2 more premiums and make it paid up or forget the money and start paying it in PPF. Am I doing correct thing in point b, especially need advice on points c and d.
I am not sure why you still have confusion here .. Its the same case. Started in Jan-2008.Maturity on Jan 2018.Premium is Rs.2000/month. Second is Bajaj allianz policy of UNIT GAIN PLUS GOLD SIZE TWO. Started in Feb-2008. Maturity Jan-2021.Premium Rs.30000/year. What should I do with this policies?Surrender?Get it Paid up? I’ve two endowment plans one is Jeevan Anand (term 21 yrs started on 15 Jun 2006) and Jeevan Saral (term 15 started on 15 Jun 2006). Premium for Jeevan Anand is 5294/- half yearly and now there is a vested bonus of 54800 in that. Jeevan Saral half yearly premium is 6065/- and has no bonus and all. 1. What if I surrender Jeevan Saral and invest that amount in MF? 2. How much amount I’ll get back if I surrender it? Whats your plan with that money ? I have purchased an SBI Saral pension plan with anual premium 4Lakhs with 10 year term earlier this year(Mar13). I am planning to discontinue the premium payment due to personal reasons. As per the terms & conditions, I should at least pay 3 years to surrender the policy. If I discontinue the payment for next year onwards, what will happen to the 4Lalkhs premium I have paid ? When will I get it back & how much ? If I inform the bank about my decision to discontinue the plan, will it be of any help, will they return the premium paid (4Lakhs) after deducting the charges/deductions ? Thanks a lot in advance for your expert advise. In case of most of the ULIP’s, you still get your money after lock in period is over . So please read your policy again in detail and see what it says in section which says – “Discontinuation before lock in period” . Even surrender charges must be mentioned in that document . My policy is an Individual, Participating Traditional Pension Plan and not ULIP. after 1 year, in case of Single Premium, from the start of the policy. The Guaranteed Surrender Value for regular premium policies, is 30% of all Premiums paid excluding 1st year’s Premium and Rider Premium, if any and for Single premium policies, Guaranteed Surrender Value is 75% of Single Premium excluding rider premium, if any. Cash value of the allocated Bonuses, if any, will also be added. The Non-Guaranteed (Special) Surrender Value (SSV) will be based on an assessment of the past financial and demographic experience of the product / group of similar products and likely future experience and will be reviewed from time to time depending on changes in internal and external experience and likely future experience. This Surrender Value will depend on the term of the policy, the number of years for which Premiums have been paid and the duration elapsed at the time of surrender. On surrender, the higher of the Non-Guaranteed SSV and the GSV will be paid. III. The entire proceeds can be used to purchase a single premium deferred pension product. I am in a dilemma now, whether I should continue with it for two more years and make it a paid up policy or discontinue now itself. If I discontinue now; do I stand any chance to get the premium amount back (after they deducting their charges) ? You are into worst situation right now . You will not get anything unless you pay for 3 yrs . If I were in your place, I would have stopped it ! I have now discontinued the policy and have shortlisted Kotak Preferred & HDFC lcick2protect. Good to hear that Shashikant ! 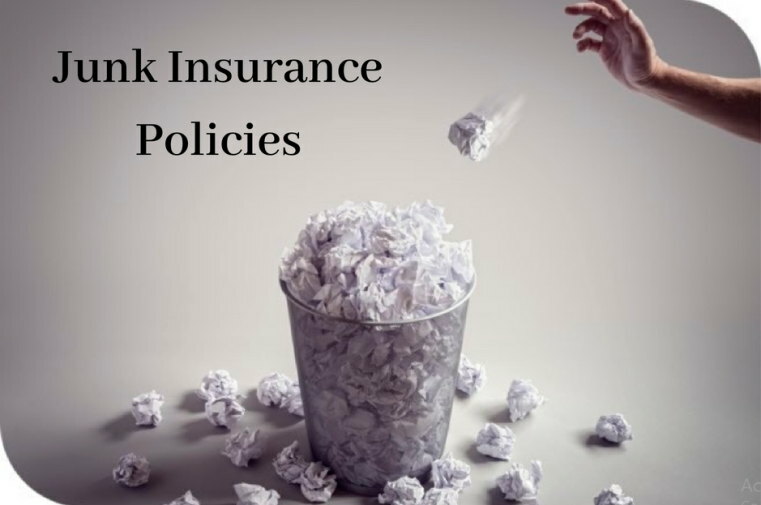 If one has such junk policies and one wants to take a term insurance, then would you suggest closing these junk policies first and then taking term insurance? Or would it be better to declare the junk policies when you take term insurance and once you get the term insurance policy, you can close the junk policies? Also, I am planning to take a term insurance for 1Cr SA. Would it be better if I split the amount between two insurance companies? I am mainly worried about non disclosure of existing policies in the new insurance policy. I am planning to close the old policies later. So I think it would be better to get the new policies (declare old policies while taking new term insurance) and after getting the new term insurance, I will close the old policies. I hope there is no problem if you declare some policies while taking new term insurance and then close the old ones later? I am 26 years old by the way. Could you also tell me if I can go ahead and take term insurance from two different companies for a total SA of 1Cr? I suggest take one single policy now as the premiums are quite low and 1 cr is now a standard sum . Splitting was great option some years back ! I have an endowment policy from Birla Sunlife & despite after paying all 38 months @ 3175=Rs. 1,30,175, the fund value reflected is only Rs.12,489 !!! I realise my money has gone down the drain & BSLI has heftily charged me @ Rs. 2.5 K pm for life insurance !!! “This is ONE OF THE BEST PLAN BSLI ever had in its Product Basket which unfortunately had to be close down due to competitors unwanted influence. This is a Term Plan kind with return of premium and no further profits would be returned in this. Here in this plan on Base SA you get an enhanced SA at a very very low price. You can observe that at Just 38 yrs he is getting a SA of Rs 1 cr at just Rs 38000/- and that too with return of premium I think this is not available anywhere in the industry.He would be getting at least his premium back as the investment is made in Enhancer Fund which is pure Debt Fund. So, tell him not to see at the returns as he would get only his premium back and nothing else and is getting a good coverage at the best price that’s all.So,ask him to keep this policy as it is not available in the market now and will not get it even if he wishes in future. I just wanted to inform how the financial advisors are ‘guiding’ us people, may God / Manish help us ! Sad that your advisor was bad, he should not have done this . Its really his fault . But I am sure you must have done your homework as investor right ? You must have already learned how the product works and what you are getting into ? Correct? Did you do all this ? Thanks Manish. This article was an eye opener. Wish someone had told me this 9 years back when I brought the policy. I have completed 9 years @ 60,000 pa out of 30 years. Do you think I should surrender or make it paid up. I see no point in continuing paying for it for 21 more years. I was misold the HDFC SL ENDOWMENT champion suvidha and i have invested 90000 over 3 years( 30 k/annum) and i have just paid the third premium on 24/06/12. I then made my policy paid up status after the HFC Life executives confirmed that in paid up status the SURRENDER Charges would still reduce to 15% after 4 years and to 0% after five years. Since the date for my supposed 4th premium is nearing i Now called HDFC Life to confirm this and i was Harshly told that for the SURRENDER Charges to reduce to 15% (4th year) I would have to PAY the 4TH premium(30K) this year and ONLY Then will the Surrender charges REDUCE . Currently after payment of 3rd premium the Surrender charges are 30%, and Fund value is 83000. Thanks and Keenly looking forward for your valuable advice. there is nothing to advice here , all you need to do is check your policy document and what rules are written . And just follow that. Your blog is excellent and very informative, I have one query and need your advise. I am NRI and took the HDFC Saving Assurance Plan policy as advised by the HDFC advisor. I have already paid premium for 03 years but after reading your blog it seems I did mistake. Now I am paying annual premium of 1 Lac towards this policy. 1.I want to know in case I surrender this policy how much amount I will get back . 2. I case I make this policy as Paid Up how much amount I will get after 03 years. 3. If I continue for 10 year how much amount I will get back. Please advise because this will assist to take my decision. It would depend on the terms and conditions outlined in your brochure . Have you ever looked at it ? Hi Manish, i have two lic policy,(a)jeevan sathi,double cover and another (b) jeevan sree.Date of commencement is 28/04/2008 &28/04/2009.premium Rs7506(half yearly) and Rs 18418 (half yearly).Both are normal primium paying policy.Now I want to surrender my policy.now my question is (a)what will be the surrender value( both of the policy)? (b) or any other suitable path to get rid of premium paying? Surrender value can be taken by LIC only . I have 20-year money back policy and paid one half year premium ( 13450 ). If I surrender the policy what amount will I get. How to calculate the surrender value? I was surprised when my advisor who asked me to take SBI life insurance policies 3 years back suddenly asked me to surrender them and put the money in something other product from SBI Life. This would immediately put me in loss. The policies are SBI Life Unit plus III (1 Lakh/annum for 15 years) and unit plus III pension (50000/annum). 3 premiums have been paid already. I now want to stop these and go for MFs. I was wondering what is the best option, Surrendering or make it paid up by stopping premium payment? Thanks a lot in advance for your valuable suggestions. IF I HAVE A LIC POLICY T.NO 75 WITH TERM PLAN 20 YEARS IT COMMENCEMENT DATE WAS 15-04-1998 WHAT I WILL GET AFTER POLICY MATURITY. Note that I have total 3 such policies (2 more for my brothers, differing slightly only in premium amount). I will be getting 1,07,122/- in year 2027. In SV option I will be getting 1,07,122/- in 2027. And in Paid Up option, I will be getting just 83,200/- in 2027. If my above calculations are correct then, SV option seems to be a better one. Please advise on this, should I surrender the below Jeevan Anand policy (Since 2008). I have already paid 5 premiums, and due to pay 6th in Jan 2013. I have recently taken a Term Plan (Aegon Religare, 50L). Convert it to paid up ! How is paid up, better than surrender value? I see that you have suggested to surrender such policies. Why not to surrender this as well? Please let me know, if I am missed any point above. Hi Manish , thanks very useful information. I have a quere … I want invest 50k per annumn in SBI life money back policy option 3…. as per SBI agent i can surrender this After completion of 5th year. I will get complete amount(Rs. 250000) + bonus(10% of SA) + 3% of SA per year……. Just i need to inform in advance in written application while paying 5th premium …. Pls guide me if this is this correct….& plan is ok? I have 1 Endowment Policy of 50k /yr. & Paying premium form last 4 yrs. I want to surrender now …please let me know will this be right decision. & how much Surrender value i will get .Person ,from whom I have taken that policy ,is telling that even I will not get my invested amount. Yes, you should expect only 30%-40% of your invested amount , thats all . You have no choice , cut the finger or cut the whole body later in future . I have paid 2 monthly premiums and now want to surrender. But Max life does not allow me to surrender. If I stop making payment then the policy will lapse automatically but I have done ECS. So they will draw the money from my bank account and if I dont keep money in my account then that will affect my credit rating because of ECS amount will bounce. just ask them to stop the policy and let it go now . Ask your bank to stop the ECS ! Thanks a lot for the below info!! I have LIC money back policy, 20 yrs , premium 31,500 per year. started in sept 2008 . i’m suppose to pay its next 5th premium by sept 2012. Now what do u suggest, shd I pay this premium or surrender the policy. 1/ if I surrender approx how much will i get? 2/ if i continue and pay 5th premium , will i get the assured return after sept 2013 or sept 2012? Thanks in advance for your help Manish!! Three year back i had taken a whole life endowment plan table No-5 of LIC with option of 30 yrs premium payment.Kindly suggust if i surrender now than how much i will get and if surrender after 5 years than how much i will get.Do i get the bonus or not.Infact I spoke to my agent and he is saying that i should continue and after 15-20 yrs he will convert the policy and i will surrender the policy than i will get the bonus also. I need your suggustion on it. You will get very small amount, you will get bonus , not only the reduced amount , because bonus number is a future numner, you can always get your actual surrender value by contacting LIC . First of all thanks a lot for your practical knowledge sharing, which is helping lots of people to plan their financial life by taking proper actions. I am following your blog from past 1 month & it is working as an eye opener for me also just like others. I also belong to the list of guys carrying the burden of useless products. Thanks again to your posts that I started taking interest in my financial life. I checked all the products I am having & found that I am fortunate enough that I am having only 1 poor product & i.e. Kotak Life’s Super Advantage ULIP. Its premium is 15K Yly & I have paid for 2 Yrs, but looking at its performance, I am planning to stop its payment & invest that money in some better direction. So please suggest what should I do, pay the 3rd Yr premium & then go for surrender or without paying anything opt for paid up, or anything else? Please suggest. Also what should be the better direction to invest that money apart from PPF. Did you take it after Sept 2010 ? If yes, the lock in period will be for 5 yrs, you better keep investing in it as the charges would be lower , but if it was before Sept 2010 , then you can better surrender it ! Endowment policies dont give back much when you surrender them in starting years .. I think the surrender value company is saying has no issues and wrong calculation , thats what you will get . As in your example ,I too fell prey to HDFC SL endowment champion suvidha and i have invested 90000 over 3 years( 30 k/annum) and i have just paid the third premium a month back. My sum assured is 1000000 over 10 years period. My current fund value is just 78000, and if i surrender the surrrrender charges are 30% of fund value. SHOULD i make the policy PAID UP instead , Is it allowed in this plan?? Can I make it paid up and surrender after 5 years when the surrender charge will be Nil. Yes you can do that , you just need to stop paying the premium, your fund value will move as per market , you can sell it after 5 yrs, but note that some charges per year will still apply ! Then invest the recovered amount elsewhere! In that case first transfer it , and then surrender ! I have done a money back policy Table no 75 from LIC where I have to pay Rs.32000.00 yearly premium for a SA of 5 lacs with a tenure of 20 years. Will be getting a money back of Rs.100000.00 as proposed this year..
Should I pay an advance premium for three years with the money or invest the money to some better investment options and pay my premium every year like before?My thought on paying advance premium is not to invest my own money in this bad endowment policy….or should I pay this year’s premium to take Rs.1 lac payback and then pay out or close the policy…pls suggest. Yes , better pay one more premium , take 1 lac and then close the policy ! Please let me know the tax implications on the surrender value in case of life insurance policy other than the ULIPs. it was quite confusing when i searched on the internet. many websites says its taxfree after 3 yrs and some says it is taxable only if there is gain. I badly need a term plan. Would you suggest me to surrender these policies or make them paid-up? Or I continue with them and buy a new term plan. I have sudarshan Plan B of SBI Life. I am paying 31118 per year. I have 7 lacs cover plus 7 lacs accidental cover. I would like to surrender the policy as I think the returns on the policy are very negligible and 7 lacs cover is also not solving my purpose. I have taken aegon religare 50Lacs policy. What surrender value SBI Life is calculating is far below my calculated value. As per the policy document the surrender value should be 65% of all the premiums paid less first year premium + bonus vested on the policy. bonus declared by SBI Life so far is 46000. As per these factors, my calculation comes around 1Lac but what they are saying is around 60k. They are saying that “”cash value of the bonus”” will be paid on surrendering the policy. For which no formula is given in the policy document. They are also deducting some surrender charges which are no where mentioned in the policy documents. Kindly suggest what can be done in this case to get the surrender value as per the policy document. I have already paid 4 premiums..
Would it be beneficial if i invest the 31000 per annum in PPF.. or I should invest partly in PPF and partly in ETF gold funds… What are the pros and cons of ETF gold fund schemes?? Is it a ULIP ? Please suggest if I should surrender/make paid-up this policy. If I surrender it now, I will get returns ONLY AFTER 5 YEARS lock-in. Also, I will get returns at the rate of 3.5% p.a. on the fund value(on the date of surrender) after 5 years. If I do not surrender, I will get returns at the market rate, which could be more than double of 3.5% and my cover (Rs. 40,000/-) will also continue. Mohit, thanks for providing all the good info. I am hoping you can help me out with my problem. I have a LIC Jeevan Anand policy that I started 5 months ago. This is my first policy and I wanted to go for Jeevan Saral but was ‘forced’ in to taking Jeevan Anand as the agent and local branch manager said it is better as it gives risk cover after the policy also…I wanted to go with 15 lakh cover which would have been 25,000 Rs p.a. premium for Jeevan Saral, but with Jeevan anand it is 75,800 Rs p.a. with 25 lakh maturity amount. I did some calculations and found that Jeevan Anand is really not a good policy as investment and I should have gone for a term life plan. I read your response that if only 1 year premium is paid, its better to forget the money and move on. But, I am wondering if I reduce the sum assured from 15 lakh to say 1.5 lakh. This will reduce the annual premium to 7,580 Rs. In this case would I receive the first premium paid at the end or would I just receive the maturity amount based on reduced sum assured? I do not want to loose my hard earned 75,000 Rs. Please help and advice! Sadly the best choice would be to forget and move on , nothing else will work in your case! and come out of that thinking that they forced you ! , They just convinced you and you got convinced , the checkings and studyings which you did AFTER was to be done before ! , thats the problem ! I bought a endowment plan from Max NewYork life insurance company for a tenure of 15yrs where premium paying term was 6yrs. Premium was 35K for max life cover of 4lacs and on maturity, amt recieved would be approx. ~3.5lacs. I have already paid premium for 3yrs. Shall I pay remaining 3 premium or surrender my policy? I have checked my surrender value with company and is abt 50k. Please suggest. Based on ur various articles, I have purchased a term policy with life cover of Rs. 1 crore from ICICI icare. Based on ur suggestion, finally I surrenered the policy. It was really difficult to convince my parents. It was also painful to make a hard decision where I was losing Rs.55,000 (losing on short basis which is more counted by many individuals than gain in long term). Thanks once again for helping individuals like us. Make sure that you have done your own homework on both the scenarios (surrender and continue) and convinced yourself that the decision was right . you cant just move ahead based on one person saying . I have checked n calculated mutual returns @12-15% and policy returns for next 12yrs. Finally mutual returns was more inspite of losing Rs.55k (due to surrendering). Yes .. thats what is the reason that even surrendering should give better results . Now its your decision and you know what you are doing . thats the point . go ahead ! I have received my surrendered value (Rs.50080) just now. I opted for online payment and they transfer the amount in 15days only. Great!. Soon I think I will received the letter also. If u want I can mail the scan copy after receiving. Thanks to u & all other who inspired me to take a right move. Good to see you taking actions ! … now decide your next move ! Great blog, its an eye opener. Now i realized, what a financial fool i am..
Can you elaborate what mistakes have you made ? I was mis sold HDFC Savings assurance plan in which I have already paid 4 years premium of rs 25000 per year . The policy term is 10 years . 1. How were you missold ? I mean who forced you to buy it and how did he do it ? 2. What kind of analysis or study you did before buying the plan . Ans 1 : I went to HDFC bank for tax saving FD (section 80 C ) . The representative of HDFC bank told that they have one better savings plan than tax saving FD which will give assured return of 12 % and you have to pay only for three years and you will get money back with 12% interest . They also clicked my photograph in bank itself & also auto debit ECS form was signed by me .when I asked him if it was an insurance product, he denied it. To my utter shock when I received the documents I came to know that it was a insurance plan & term is 10 years . Since I had no time & also at that time I thought it ok therefore I didnt complain to anybody . They are really cheaters . Ans 2 : No analysis was done , the plan was missold . I am also stuck in similar situation where i have purchase Kotak Money Mutliplier for my child. I have paid 2 installments (second by mistake) till now. This plan gives very less risk cover and its return value is also very low. Now he has offered me to convert it to ULIP plan. Does it make sense? Also is it possible? Better not make second mistake by entering into something which you dont understand .. Better keep it simple and put more money in plain mutual funds . Res. Sir, I have 2 SBI life Policy Sudarshan-B. From 18/jul-2005. I paid regular Premium and my accured Bonus is Rs. 5093.75 till date for both polciy. Now I need to surrendar the policy due to my perosnal problem. 1)Policy is for 25 year & second is second is for 20 years Polciy premium yearly mode by Rs. 3435.00 & 2726.00 Total premium Paid till date is Rs. 20503.00 & 16273.00 Would you like to send me the surrendar value of the above. i have a market plus I ulip plan of LIC and already paid 12000 for 1 year.there is 3 year lucking period.shall i continue to pay for 2 more year or shall i stop investing? I have taken jeeval saral from LIC and paying 73k premium per year. Just paid one premium. Is this policy worth? I am also looking at the term plan from 2 insurance companies with SA of 20 lacs each for 25 years. Please suggest best options. I have one Future Plus policy from LIC bought in 2006 Paid 60000 till date FV = 79000. Its open end policy just like MF with some Annuity feature attached to it. What do you suggest its an MF for me with 25% return should I make additional Top ups till its maturity date to reap the benefit? Its not like MF , its a Unit linked policy and may be now as you are out of locked in period you are calling it like MF , because you can get out of it anytime . 1. I believe at the end of the policy, I will get total premiums paid till that date + bonus as of date. Is that correct? 2. If I surrender today, what do I stand to lose? Entire bonus + 70% of premiums paid? 3. Life cover is only 200,000/-. If I make it paid-up, what is the impact other than lower life cover (it is low anyway!)? Thanks for your answers, Manish. 1) The policy details page mentions the plan as “The Endowment Assurance Policy (T No 14). 2) The website does not provide any surrender value. How can I find that out? I had read somewhere that even the bonus will not be paid in full if I surrender. Just want to know if I should get out now or pay out the remaining 6 premiums. Yeah, guess I’ll check with an agent. The premium is not much but if I can offload, one less policy to manage. Thanks for your inputs, Manish. I heard banks ask for a LIC policy equal to the educational/Home Loan amount when they sanction the Loan. My father had to buy a junk policy about 7 years back to avail my Educational Loan from Central Bank. Now I am yet to decide whether to surrender that policy[Loan amount already paid back] or make it paid up but i think quite a few people have to take endowment plans against their wish, only because they are availaing Loan. is there any other way out than taking such junk plans in those cases 🙁 ? Thats banks way of selling the policies , they ask you for it so that incase you dont have , they sell it to you . If you dont buy , they dont co-operate too much and decline your loans , there has been cases like these ..
i have taken enhancer policy from Birla Sunlife i have paid two premium of Rs 11998/- each but i do not know what is my fund value my 3rd premium is due now should i pay or not pay i am in dillema. What policy is it ? Is it ULIP ? The link to the topic of GFactor analysis https://www.jagoinvestor.com/2010/05/gfactor-your-decision-maker-for.html mentioned in this article is not available now. Although its too late after this article was published, is it possible for you to please share that article? Thanks Manish for the correct link. I came across your blog very recently (some 3-4 weeks ago) and I found it not only very informative but also very educative especially when it comes to financial discipline. I must thank you for the invaluable insights you give to people through this. I also started thinking seriously about my ULIPs which I have purchased 4 and 5 years back and got few doubts related to the surrender /partial withdrawals from them. 2. The annual premium to SA ratio: I guess it needs to be less than 5% from exit tax considerations. However I did not get exact details related to these points at one place and I am getting confused. It will be great if you can throw some light on this. Thanks Manish,Its not a life policy.It is a health policy.and my DOB is wrongly printed on the health card also, sent by medicare TPA. I am not very sure on this . Its weird that you cant change your date of birth , but it can be issue in case of making claim if you die 🙂 . Because then things will not match as per documents . Complain to Insurance ombudsman and cc to IRDA email id . Yes, term insurance have sometimes a rider called accidental rider , which covers permanent disability . Making your policy will stop the coverage . Hi Manish, I am thinking of making my 2 money back policies paid up. But these policies provide some cover for permanent disability. What do u think I should do? If I make the policies paid up will those be covered for the rest of the policy period? Does any term insurance cover total permanent disability? Thanks again for ur valuable suggestion. I replied you on facebook . I think this is my first comment on your blog. I came across your blog and read few article…after reading article related to “why endowment policies are bad” I am literally shocked to see the calculations and how big loss I am into. I feel very bad about myself that I have put my such hard earn money into buying this policy 5 years back. I remember, I asked my agent about insurance policy which will suit my needs and coverage but he didn’t even told me about term plan. I am paying Rs. 30000 premium every year. I spoke with the agent and asked him as to why he never guided me about term plan and he was silent. What can I do at this stage? Now the surrender value is very less…just 45% of what i paid so far…I am not at all interested in continuing this policy and repeating the same mistake again for another 25 years and with low coverage. But I am literally feeling bad for the hard earn money i am going to loose now. Insurance industry is full of cheaters, it seems…white collar people will rob you officially. I would like to thank you that after reading your article I understood correct meaning of insurance. Sorry to hear your situation , but thats something you have to accept now , You are in bad shape but realising this is one thing which has great , think about millions of others who are continously paying their hard earned money for decades to earn pennies at the end . You will loose 55% money , but thats the only way out and you should take it, atleast you will not suffer pain for future 🙂 . You can divert this money which you get and all the future premiums in something better , first preference is to gift your family a protection and confidence that even if you dont exist tomm , they can lead the life which you always dreamt of 🙂 . So take a proper term cover and then plan for your investments later. Regarding Agents , yes their duty is to provide the proper guidance to clients and make commission on that , but sadly they just concentrate on commissions most of the times . So the best way in this world is to make yourself stronger with proper information . Each of your word is true. I am afraid that I understood the real definition of insurance now and not 5 years back. But anyways, I am going to stop that policy for good and definitely go for very suitable TERM PLAN with enough coverage. I will read your articles for more information. Another best thing i am going to do is to tell the same thing to 100’s of other people to save them from seeing future disaster. he said this is quite generic formula to calculate your coverage for rest of the years(remaining 25 years in my case) after you make it paid up. what i think is even if we consider the figure as to be max Rs. 2,00,000 it wont be a good move to go for paid up option for the following reason. I have explanation to give. => SBILife has one term plan product called SBI Life Saral Shield. With their online premium calculator I provided exacted figures of coverage(8.5 lacs) + 7 lacs of acc. death and critical illness rider. how do you think about this ? I fully understand that its my call to decide but trying to double check with you. –Am I correctly calculating the things I explained you. From Insurance point yes you are correct ,but you are forgeting that you will get the money also in your existing policy at the end if you make it paid up . The agent has given the right formula it seems and thats the standard one with other companies also . I would say that you should look at your scenario like this . you are paying 30k right now , better take a term cover of the suitable amount you need ,why just 8-10 lacs ,take it for 50 lacs or 60 lacs, that would be the right cover for you i guess and what ever remains should go for your investments . 0verall you are correct in approach , you should not contiue the existing thing . Money at the end of the policy in case of paid up… I didn’t know that or agent told me. but the money will not grow…right? i mean, so far I have paid premium of Rs. 1,50,000(30000 *5) will that grow also as per original policy feature ? if they just return back 1.5 lacs after 25 years whats point. It will be of now value by that time. Isn’t it? Definitely, I am going to purchase good cover above 50-60 lacs but for calculation purpose with existing policy cover I chosen small coverage figure. Thats how it is , with paid up option , you get your premiums along with accumulated bonus at maturity and your insurance cover will be for next 1 yrs only , thats all . Its all written in the policy document even at the time you took the policy . So now you have to take the decision of what you want to do next 🙂 . SI 3lacs, term is 15 years, premium 11500 half yearly payable. So far i have paid 5 premiums ( total 58K). 6th installment is due on 15th of this month. 1. If i discontinue without paying 6th installment – how much i can get? 2. If i surrender after paying 6th i.e. after completion of 3 years – how much i will get? 4. Is it better to make this policy paid up? If yes, how much i’ll have to pay to make this policy paidup? 1. Zero . It actually depends on which policy you have taken , but most of them acquire a surrender value only after 3 yrs of premiums paid , so if you dont pay 6th premium , you dont get anything . 2. You will get 30% of all premiums excluding first year premium , this is 30% of your 2 yrs premium , which is 30% of 46,000 = approx 15k , but you have to confirm your agent for actual number , this is just approx . 4. You dont have to pay anything to make it paid up , after 3 yrs of premium is paid , if you discontinue the paying , it automatically becomes paid up , but better inform the company that you want to make it paid up . Also its possible only after 3 yrs . Making it paid up is good or not , that you should compare with the case where you dont make it paid up . 1. If I stop paying premium after 3years and make it as paid up and keep the policy alive till it matures, after maturity will i get something? 2. If I keep on paying all the premium till 15 years (total premium will be 3.6lacs). I’ll get only 3lacs + bonus on maturity. Suggest me, which option is better. Your article is an eye opener for me! I have an endowment ULIP policy called AVIVA LIFE LONG. Total tenure is: Till the completion of my 58 years of age. My current age: 32 years. Quarterly payment=5500/- i.e. 22000/- per year. Till now I payed it for almost 4.5 years. Fund value is 93,357 rupees. My current surrender value would be around 40k. Could you please help me with this policy? What shall I do with this policy? Shall I say Paid-up and get whatever amount I get after 26 years? Shall I surrender my policy and get that 40k now? When will your surrender value get 100% ? may be after 5 yrs there is no surrender charge , check that . Thanks for the immediate reply. 2 months back when I talked to Aviva customer care they told me that I need to pay till the completion of the tenure, Or else my surrender value would be less always. Anyways I will check with them once again. If, My surrender value is half only always, Then what shall I do? Please advise me. Not neccessary , your Surrender value is your Fund value and it can always become more than what you have paid, but you should not think in that way. I am Ramachandran, My age is 33. Please guide me with following Pilicies.. I have paid 2 installments. After reading your article, I want to close/Paid up these 2 policies and get one Term Policy from LIC and another from SBI. Then I want to go for another installments with the remaining amounts. Please guid me which is the right time to close/paidup for these 2 policies or shall I continue? You should find out the way by reading the articles on Surrender value and how much will it be worth , basically you are asking for Insurance Planning 🙂 . Cant be done like this . I am also in similar situation. I wasted so much amount on endowment policy for last 5 years and planning to take the surrender value back. I Don’t want to commit the same mistake by paying hefty premium for another 25 years(for such a low coverage). I want to buy the life cover /accident policy with less premium and higher sum asssured. I need your advice regarding my old LIC policies. I am 46 years old earning 1 lac per month. My wife is 45 years old earning 60K per month. we have 2 boysaged 17 and 14. I am having a housing loan of about 8 lacs. Another housing loan of 27 lacs is insured by SBI life. Both of us are having PPF, EPF accounts. No investment in stocks. No other liabilities except children education. After going throgh your blog, I am now planning to go for Term Insurance. a). Which of the above policies I should surrender, which I should make paid up and which I should continue? b) I am planning to take Term Insurance of (30 lac + 30 lac) for me and (20 lac + 20 lac) for my wife? I am more comfortable with LIC than private players regarding claims etc. Your take? Kindly suggest. c) Planning to invest 40K per month for me and 20K per month for wife in mutual funds by SIP for atleast 15 years. Kindly suggest the best products for a financially illeterate person like me. d) Is there any security risk involved in using sites like Perfios.com? e) Again what is the better option from using FundsIndia.com and using good old agent? b) You can go with LIC . whoever I would not mind spliting it with one private insurer , but you go with LIC only . Why insurance for your wife ? Is anyone financially dependent on her ? d) Its a personal call . there are people who use it and find it fine . e) Again there cant be a definate answer . its a personal choice and how confortable you are . Fundsindia is used by many and they are happy with it . i feel wife is also contributing to the family with her income and she definitely needs insurance till their son are independant. you mean to say if the husband is getting paid less than the wife – the husband doesnot need insurance at all? This site is a real eye opener. I have started to invest in 4 mutual funds via SIP from this new year and have opened a ppf account as well after going through your site. Thanks a ton for this site. I was paying Endowment policy. I I have already paid 3 years. Should I go with paid up or surrender. My due date for this year is nearing. Arun . I think you should surrender the policy . Make sure you calculate the IRR of the policy and see if you are happy with that or not . Better start goal based investing through MF and ETF’s . Thanks a lot….Keep enlightening the Financially illiterate like me…. I need some suggestion from you regarding making some of my LIC policies paid up…. 1. I have an LIC endowment policy for which I am paying premium since 2001.So this policy is running since the last 9 Years now. a> My first question is if I make this policy paid up will I get back the following amount at the end of the Maturity Period. Please verify and confirm. b> Although I make the Policy Paid up will I be covered for the SA proportionate to the period I have paid premiums for it. And will this cover continue till the maturity period of the policy. c> Do I need to inform LIC to make the Policy Paid up or that happens automatically when I stop paying premiums. 2. I have a Jeevan Tarang Policy for which I have paid premium for 2 Years and would like to make it paid up. But I came to know from your blog that I have to atleast pay premium for 3 Years to be eligible to make it paid up. 1.b : No , you will be covered for full SA for next one year of making it paid up. This is the rule with most of the policy now a days , better confirm . 1.c No you dont need to inform , Stopping the premium means it will become paid up . Note : The better option would be to surrender the policy and take what you get now .. better to use that money to invest in normal equity or balanced funds . Remember if you are going to leave you money for long term . anything other than equity is risky :)) . Suppose a person takes a policy for 20 yrs and has a SA of 10 lacs , now if he pays for 5 yrs and then makes the policy paid up , his question is that will his cover be 2.5 lacs (proportionate) till maturity . Answer is YES and NO , some companies what they do is they give you insurance for full amount (1o lacs) for one more year and then your insurance ends . Some give insurance till maturity for proportionate amount . I hope you got it ? No ? Ask again if you have not . Seems it is a very actively participated discussion. Let me contribue my 2 cents. Offcourse, this is from my personal portfolio. The figures are from the website of LIC against my investment for the past 14-15 years. It is evident from the above that the redemption is due in 2015,2016 & 2020. Pl advise which one will better- paid up or surrender? On insurance point of view, ULIP policies never give you enough insurance coverage with low premium. From investment perspective, since large portion of money goes as commission in initial years, the compounding effect also goes in vain. So the ULIP will never match Term + MF combination. Just stop paying premiums from hereon. Your policy will be automatically converted into paid up policy. To understand about it, just read other articles of this blog where this topic is well explained. Then take a term plan for your insurance and go with right mix for investment needs. Surrendering policy would give us almost nothing, but on the other hand keeping it would just make it grow 5-6% annually and after 20 years we’ll get money with no value. However, its really hard to surrender at this time because the mind will say, I’ve paid 4 premiums and I will get not even one premium amount! can you elaborate on that with an example or more details . No, it is best to surrender the policy and get the cash value. The amount can be invested anywhere where we want – and it’d outgrow the amount if we had kept the policy live with paid-up. However, my indication was that, it’s really hard to surrender the policy as the cash value may not even equal to single premium of the total 3 years paid. The psychological barrier of comparing the current situation [instead of analyzing what we’d get otherwise] with premium amount will make it difficult to take the decision. However, surrendering or converting to paid up policy are not the only options available. If it’s an Endowment policy, there may be option to avail the loan benefit from it. The loan amount could be much higher than the amount we get if we surrender. If it’s an Endowment with MoneyBack option, the first MoneyBack may be due on 4th year. Please go through the whole policy document and you’ll get some picture on how to discontinue the policy and calculate on what’s the best option for that. 1. the psy­cho­log­i­cal bar­rier : You are correct that its a tough thing .. Thats the reason that people who can take that difficult decision will get more than those who cant … Its not something every can do . Just because its a tough thing to do does not make it an option we cant take . But you are correct that most of the people are not able to do that . 2. Taking Loan , If you want to take a loan , you need to continue the policy in that case . Just stopping the policy and taking the loan will not do as Bank will make sure that the Worth of the policy is good enough . So even Loan option does not look best to me personally , but good that you suggest a new option . I think the best thing would be to surrender them and switch to Term , Its a tough decision to take I know 🙂 and a painful one , just other "right decisions" in life . I am fan of Jagoinvestor and came across it some 10 days back. This is my first comment rather query that i am alredy having lic endowment policy of sum assured 6 lacs (annual premium 22850/-) for 25 yrs. I have paid 4 premiums. Kindly suggest wht i should do now. Person which want to surrender there insurance policy.Below rule will be applicable for them. premium(s) towards Accident Benefit are also excluded. So then i think its better to invest in ULIP then going for combination of term insurance & MF. Manish,Which one is better ULIP or MF? 1. Yes , you will get less tax benefit , but then you can invest the extra money in some thing else like tax saving FD or even mutual funds to get the tax benefit . you have to decide what is important to you , getting tax benefit or getting right product for yourself . 2. 12% return can be generated without having much knowledge and time , Just start a SIP and do it for long term , This is what I also showed on my article which talked about long term returns from equity . LIC is a company backed by govt , its not exactly the govt . There are different type of products and endowment is one of them , the worry is that they are not taking proper action on spreading Financial planning education . if take term insurance then will only get 6,000 relief income tax relief. 12% returns will be achieved if some one has proper knowledge n able to invest correctly.All people can't get 12% and in order to get good returns u have to be attentive n need to invest time for this. while in endsorement u can sleep n needn't to worry at all. 3.Flexibility is there for sure.Totally agree. Give ur view on 1 & 2 point n anything else if its there. Did calculation to enlarge the scope of discussion n to understand thing properly. I was thinking if endsorement is really bad then why govt/lic encourage such things to come out in market. As per my knowledge i think people choose more endsorement plan rather than term insurances. Good work . Thanks for taking the pain of calculating this . However ,let us concentrate on some important points here . 2. Why are you getting conservative with returns from Mutual funds for 25 yrs time frame , you have taken 10% . I agree that its better to be conservative, but 10% is very conservative ,we have already seen that equity in 25yrs can give more than 12% easily (fingers crossed) . Hence , you should assume atleast 12% . with that 22 lacs is what you get after 25 yrs . 3. This is most important , FLEXIBILITY !! With term plan + Mutual funds , you have flexibility of stopping the life insurance policy , liquidating your money in case of emergency , increase decrease your investment and shift between the choices . The main thing is 3rd point , Traditional policies are such trappy products , you cant do anything with them , you are just stuck there like a mouse in a cage . share your points if any . 12 lachs.I get 12 lachs by 5.9441 rate of interest. and MF for 25 years. for over all 25 years then i get same arnd rs12 lachs. Amount which I get after 25 yrs is almost same in both cases. And the most important point which attacts them is Security and one which makes them jump into this is tax saving . I think most people things that taking endorsement plan will have four advantage. 1)Will get income tax relief under 80(C)?In case of endorsement plan tax relief will be more. 2)Some monet at the end of policy. 4)Loan in low interest rate. These four things will not be possible with term insurance. This is the research on SIP and one has to go really long say for 20 to 30 years to reap the benefit of modest returns. In such a scenario, it is better you go for mix of min term to cover sufficiently and balance put in other safe investment avenues which includes other insurance policies. What you suggest , also depends on risk profile also , what do you suggest someone who requires 15% to acheive his goals like Retirmenet and child education , how will he acheive his goals by investing in Endowment plans , you tell me ? 3. More theoritically, yields across asset classes are always same and higher or lower yields depends on the risk profile it enjoys….am i right? Not sure what you mean here .. can you please get back with more clarity and other answers . 2) Prepay my home loan. Once home loan is done I will be using the excess to add to MF investments. People take heart and make up yourminds to move out of these bad investments. nice to see ur reply. 1. Term insurance premia paid is not refundable. Then in that case why waste our hard earned money and give free cake to insurance cos.
Hi , I always take others views as alternative only , never an offence , feel free to put your views freely . There are some basic things you have to clear . – Not all Insurance policies provide Pension , There are specific policies which does , like Jeevan Tarang and not Jeevan Kishore. – I agree with your note that "past return may not repeat in future" , but that is more of a concern when your time frame is small , With a long time frame like 20-30 yrs , There has been no case when something else other than equity has performed better . Endowment policies returns dont even beat inflation !! , I just wonder in which case one should buy them for there long term needs . The 2 yrs performance you are talking about is a special case . its 50% loss .. That has happened only 2-3 times in history in such a short span , And I accept that in short term it can happen again , but we are talking about a long term commitment here and not short term ..
With long term , I beg to differ than a return of -50% or even -10% is possible . What do you think about this ? Feel free to give your views . Though this post is welcome one but i think you ignored certain basic facts before coming to this conclusion. Policies provide not only life coverage but also other benefits like pension schemes. Your assumption of investing less premia to cover via term policy and investing rest in mutual funds to generate better returns may not hold good in future as the past performance may not get repeated in the future. Second the returns are not adjusted for inflation. Please treat my views as alternative one and no offence meant please. Sure , first ask your LIC agent , then nearest LIC office and then use RTI if required . sir, my policiy surrender value please. policy name-jivan aanand hyl policy dt-25/04/2003 to 22 years 6month primiums rs.5855=00 and one year primium rs.11710=00 total paid 7years rs.82000=00 and accrued bonus rs.82000=00 policy loan rs.37000=00 to last 7 month so please sir my policy close today whate net amount my hand cash oll loans and intrest cut net rs please me by. U should talk to your agent on this . Thanks Manish your suggestion. I will contact LIC and check what to do. This is a much awaited article. I think all the people in India should read it. Pls keep up the good work. Dear readers plesse forward the link of this article to all ur friends n relatives. Lets help in manish's mission of educating india. By going to nearest LIC office can resolve ur confusion. Visit Lic office if u don't get any information from any where. I visited my branch office of LIC and they informed me to stop paying premiums and automatically my policy will become paid up. My policy is 4 yrs old. Is this information correct ? Generally , these policies have surrender value after 3 yrs . Ask LIC and if no answer use RTI . You will not get anything if you stop it before 3 yrs. I think the best thing is to stop it and forget what you paid . Its like cutting your infected finger and save your whole body to stink later . taking term policy should be done in any case . It all depends on what are your future plans and how much is your risk appetite . I have already told what can you do with your old polices .. you should do the same thing . Look for appropriate cover through term plan . Hey Manish , Nice article . I have a LIC endowment policy . Do you know if it it possible to Surrender or make it paid up . Its in force since last 3 yrs . Thanks Manish for the work you are doing. 1. Money Back => SA 25 Thousands =>term 20yrs =>Premium 1585 =>Started in 2000. In force. 2.Money Back => SA 1.05 Lacs =>Term 20 yrs=>Premium 6643 =>Started in 2006. In force. 3.Money Plus => SA 1 Lac => Term 20 yrs=>Premium 10000=>Started in August 2007. Only two premium paid. 4.Jeevan Chaaya=>SA 1.05 Lacs =>Term 18 yrs=>Premium 6458=>Started in 2008. In force. 5. Now Looking out for good term plan. Please suggest what should i do with my old policies. I surrender my Money back policy (20yrs) this week after 11 yrs for some personal reason. But the amount i get is very less and its not solve my problem. There is any option in LIC to reopen surrender policy. Thanks Manish, It is a nice article. Can you suggest what I can do? I have following three Policies. 2. New Jeevan Suraksha – I (T.No. 147) Policy Term 26 (Premium Payment Term: 26); SUM Assured: NIL; Premium: 10k; CommencementDate 4/8/2004. Please let me know can I make the Policy paid up? In my case i have just recently took the policy n still not one year is also completed. What shd. be my next step.Paid up or surrender ?? 2)And rest invest in MF or ULIP.